At least seven people have been killed in a huge blaze in a high-rise building in an upmarket commercial area of the Bangladeshi capital, Dhaka. More than 20 others have been injured. 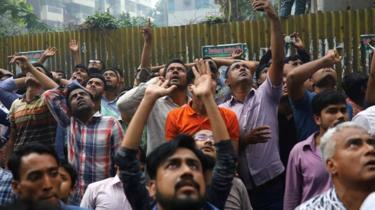 Dozens of people are feared trapped inside the 19-storey office block in Banani. People were seen shouting for help from windows and local media say some have jumped out of the building. 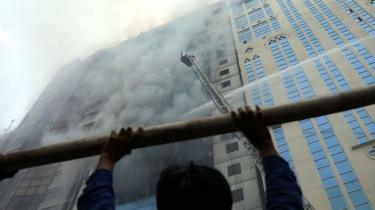 A massive blaze in Dhaka’s old quarter last month killed at least 78 people and injured dozens more. Fire crews at the scene, backed by members of the navy and air force, say the blaze has been brought under control. “Nineteen fire-fighting units are working at the scene. Bangladesh navy and air force have also joined to fight the fire,” duty officer Mohammad Russel from Dhaka’s central fire service control room is quoted as saying by AFP news agency. Air force helicopters were seen rescuing people from the rooftop. Helicopters also dropped water on the burning building from above while hundreds of panicked relatives and friends gathered outside the building. Large fires are relatively common in Bangladesh, owing to lax safety regulations and poor building conditions. Hundreds of people have been killed in recent years. Last month, a fire in a slum in the coastal city of Chittagong killed at least nine people. Dhaka, with a population of more than 18 million, is one of the world’s most densely populated cities. Some 3.5 million of its people live in slums, according to the World Bank.